Guitars have 'em, banjos have 'em, mandolins have 'em. . .
Yep, all guitars have frets. Without 'em, steel string guitars and mandolins just wouldn't work. The strings just wouldn't ring with any sustain because the vibration would be damped by the player's fingers. Other instruments such as banjos and basses have fretless versions, but the majority use frets to define their notes. 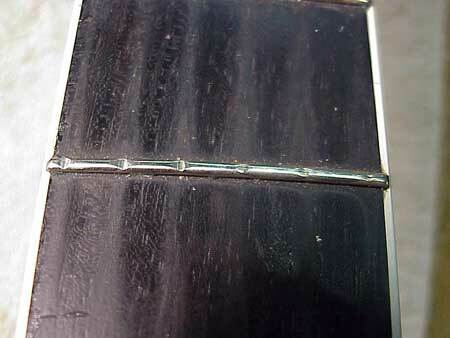 In fact, the shape and condition of frets is really important for tone production. 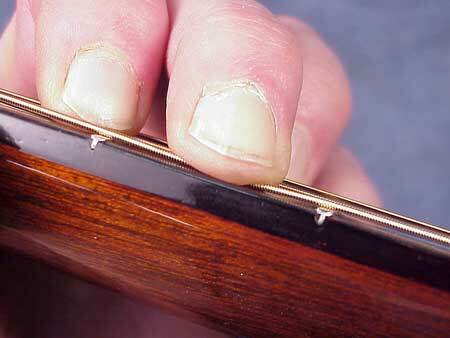 Let's take a look at frets and some of the ways fret problems can be diagnosed. As you can see, it has little barbs along the portion ("tang') that actually goes into the fingerboard slot. The portion above ("crown") has a "half-round" cross section. Most "regular" guitar frets have a crown height of around .040" - .045" and a width of about .080". 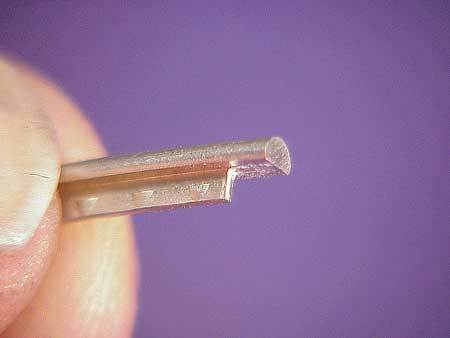 You'd find frets of approximately this size on most acoustic steel string guitars, such as those made by Martin, Taylor, Collings, Santa Cruz, and countless others. 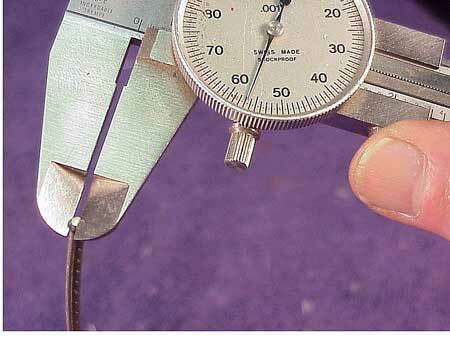 If you look at my dial caliper in the photo, you'll see that it reads .057", which is a very tall fret. 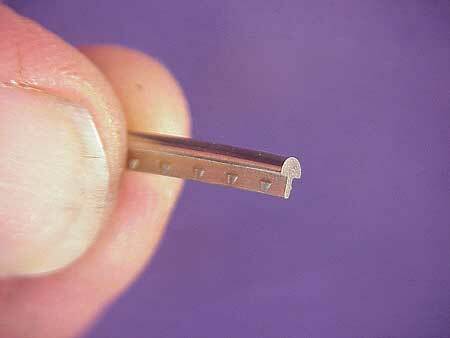 These frets are popular among some electric players, and are seldom used on acoustic guitars. I chose that size for the photos because the shape showed up a bit better in the close-up views. Frets this tall may allow a really solid contact, but because of their height, they are a bit harder to "control." Frets over .045" high are prone to intonation difficulties as the string is stretched when pressed too hard. Most players also think super high frets feel bumpy, too. That means I'll have a firm mounting for good intonation and tone. These frets measure .042", by the way. As a result, I'll have to exert more force to hold the string tight against the fret. If the frets are low enough, I simply won't be able to get a decent note, no matter how hard I press. The frets in this photograph are under .020", on average. Too low, in fact, for me to handle! It's easy to understand how frets become too low. It usually starts with the wear under the unwound strings. In the low positions especially, the first and second strings cut into the frets much faster than the wound strings. That's because they are skinny, to they're somewhat "sharper" as they rub against the frets. And, they're steel, which is much harder than the fret wire. The wound strings have bronze, brass or nickel alloy windings which are much softer than the steel, so they tend to do little damage to the frets. That's because the guitarist was a heavy capo user. Bluegrassers, among others, find themselves using a capo quite often. The capo holds the string down against the fret powerfully, and the string tends to vibrate a lot in the "open capoed" position. Under this circumstance, the fret will wear rather quickly under the wound strings. It's not all that unusual to see more wear under the bass strings than the treble, particularly if the player really "drives" the guitar hard. 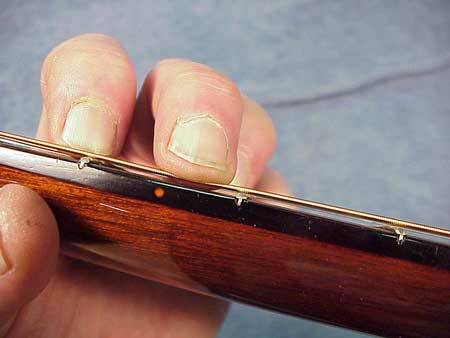 As frets become worn, they begin to be uneven in height, and eventually they cause buzzing and other difficulties such as dulling of the tone. A temptation among both players and luthiers is to save effort and money by leveling worn frets, and many times this procedure works quite well. If, however, the frets are quite worn, leveling them will bring all of them to the height of the lowest worn spot, resulting in low frets. So, it's a bit of a trade. You can level the worn frets, but you might end up with poor playability anyway because they all become too low. Time for a judgment call by an experienced guitar mechanic.